We all know those people. Those that get Chinese tattoos (纹身). The amount of fail that comes from bad Chinese tattoos are hilarious. There’s even a blog dedicated to it: Hanzi Smatter. But why do people get these tattoos? There are two answers: they are stupid and/or they don’t understand the Chinese language. I won’t go into the reason of why people are stupid, but rather I’ll look at why Chinese lends itself to these tattoo fails. A logographic language is where a grapheme represents a word or morpheme. This is opposed to an alphabetic language like English, where a grapheme represents a phoneme. In less linguistic terms, Chinese characters are words, but letters in an alphabet are sounds. This is where a big confusion comes in. People see Chinese characters as letters. That’s why you get the picture above, which supposedly spells someones name. Now you all know, you can’t “spell” someones name letter for letter in Chinese. There’s a bogus alphabet that many tattoo artists use. If you ever want to get a Chinese tattoo with someone’s name, get it in an alphabetic script please! Or just in the language that it’s already written in. No need to force a name into another language. Yes, Chinese characters do have a lot of meaning behind them. Sometimes one character can represent a lot, like 道, but for most of the part it’s just another word. 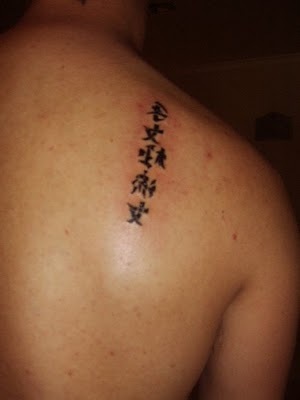 安, 爱, 和, peaceful, love and harmonious respectfully, are all candidates of Chinese tattoos I’ve seen before. Would you tattoo those words in English? If so, then by all means get the Chinese character equivalent to add some spice to your tattoo. 1) Don’t. Seriously reconsider your choice. You have seen Engrish.com right? If you get a Chinese tattoo and you get it wrong, you’ll be a walking joke to Chinese people, the same way we laugh at bad English in China. 2) If you really want one. Make sure what you want is correct. If you want a sentence or idea, then check it with a native speaker of Chinese. While you are at it, ask them if it’s weird to have a tattoo of it. 3) Learn the Chinese language first. I know, this might be a bit much for just getting a tattoo, but believe me, you gain a lot more respect for your tattoo after you’ve learned the culture and language. Would you consider getting a Chinese tattoo? Do you already have one? I’ve been considering for some time now, but it must something that is not cheesy, probably an idiom and/or something that means a lot to me. Then again, thinking about it is a lot different than actually getting one.